My name is Peter Paris, I work for a company called Flextool Australia. 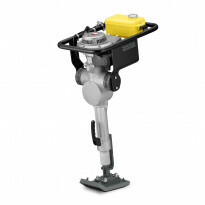 We'd like to introduce to you what we are starting to market through the Kennards group, it’s our latest Rammer. 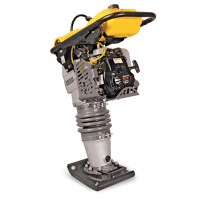 It's got added features for heavy-duty throttle, it's got a low vibration handle, it's got a solid compaction and it's proving to be very popular to the end-user market. It's fully enclosed. One of the advantages there is it's a little bit silenced, so that's an added feature because these units have been known in the past to be a little bit noisy. Further to that, we've introduced to the Kennards group the reversible compactors; 500-kilo, 300-kilo, that are used on larger applications and proving to be very good for roadworks. And yeah, so for more information, please visit your local Kennards branch and we’ll support these products further. Thank you. A hand-guided rammer used in civil construction for compacting and consolidating backfill in trenches, footings and excavations.